There are many schools of thought about re-roofing your home and the process that should be used. In many cases re-roofing directly on top of your existing roof can provide substantial savings. These decisions should never be treated lightly, because improper inspection and unseen damage can cause even larger problems later and cost even more in the long run. We at Lujan & Sons Construction can inspect your roof and determine if your roof needs to be torn off and then re-roofed or if your roof is structurally sound enough to get a flat roof repair. We also can add TPO roofing to give your roofing system an extra layer of protection. The same cost savings and structural rules apply to retro-fit metal roofing when installed over an existing asphalt roof. Again the most important part is determining the soundness of the existing roof. Durability: Today’s metal roofs are strong, lightweight, and seriously durable; lasting practically forever. A metal roof can last for 40 to 50 years with little to no maintenance. Energy Savings: Metal roofing can save heating costs in the winter and cooling costs in the summer. On sunny days it reflects heat and keeps your home cooler. On cold days its additional insulation keeps the heat inside and reduces your heating costs. Weather Resistant: Metal roofs provide a permanent barrier against severe weather conditions. It is designed to withstand winds up to 200 mph, 1″ hail and excessive weight from snow. Appearance: Corrugates metal roofing is very versatile, it comes in a variety of colors, shapes, designs, and styles. Metal is easily shaped into shingle, tiles, or traditional standing seam roofs. You can have the perfect look for your home with zero maintenance and much longer life. Property Value: A metal roof will add huge value to your home. Whether you are selling your home or staying forever a metal roof is a major asset. Insurance Reductions: Metal roofing has been proven to be among the safest of roofing materials especially where fire is concerned. In recognition of this many insurance companies offer discounts for homeowners with metal roofs. Tax Benefits: There are many special programs and tax credits available for energy savings improvements, where metal roofing generally qualifies. Asphalt shingles are by far the most common roof shingles used for residential roofing applications. They are easy to install, relatively affordable, last 20 to 50 years and are recyclable in some areas. Asphalt shingles come in a large number of styles and colors. Two basic types of wood shingles are called shingles and shakes. The difference is in how they are made, the roof shingles are sawn and shakes are split. Wood shingles and shakes have long been known as a fire hazard and have been banned in various places, particularly in urban areas where exterior, combustible building materials contribute to devastating fires known as conflagrations. Slate shingles are also called slate tiles. Slate roof shingles are relatively expensive to install but can last 80 to 400 years depending on the quality of the slate used. An important aspect to slate roofs is the use of a metal flashing which will last as long as the slates. Slate shingles may be cut in a variety of decorative patterns and are available in several colors. Flagstone shingles are a traditional roofing material. Some stone shingles are fastened in place but some simply are held by gravity so the roof pitch cannot be too steep or the stones will slide off the roof. Sandstone has also been used to make shingles. Heat-welded, Asphalt-adhered or installed with adhesive. Asphalt is mixed with polymers such as APP or SBS, then applied to fiberglass and/or polyester mat, seams sealed by locally melting the asphalt with heat, hot mopping of asphalt, or adhesive. Lends itself well to most applications. Contact one of the best roofing companies today to get estimates on masonry and kick start your roofing services project. 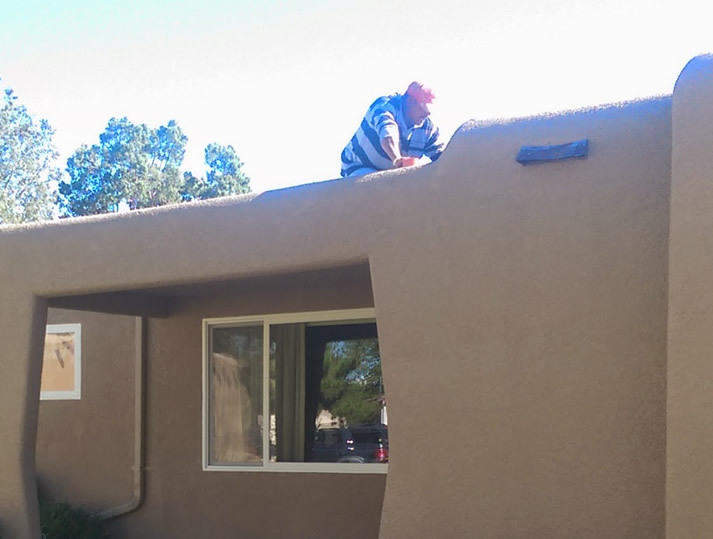 We also provide stucco repair for your stucco wall.